“A Biblical Christian Worldview” from Christian Faith Publishing author Jerald Caldwell inspires readers to reflect on what the Bible teaches and the role God plays in their lives. Written as a free-flowing essay, “A Biblical Christian Worldview” will help create an unshakable foundation for young and old believers alike. “A Biblical Christian Worldview”: a scholarly essay on numerous Christian topics that will inspire readers to open their Bibles and reflect on the Word of God. “A Biblical Christian Worldview” is the creation of published author, Jerald Caldwell. Despite his humble beginnings in rural 1950s Alabama, author Jerald Caldwell has been a serious student of the Bible for over thirty-six years and possesses a diverse array of life experiences to draw upon, including a thirteen-year enlistment in the US Army and Navy. He is a 1999 graduate of Rhema Bible Training College in Broken Arrow, Oklahoma and a 2016 graduate of Southwestern Christian University in Bethany, Oklahoma where he earned his bachelor’s degree in Christian Leadership and Management. He has over twenty years of experience in different areas of practical Christian ministry. He currently lives in Tulsa, Oklahoma, with Terri, his wife of thirty-five years. They have four children and nine grandchildren. Published by Christian Faith Publishing, Jerald Caldwell’s new book challenges readers to engage the Bible and reflect on the Word of God. “A Biblical Christian Worldview” is a teaser, an appetizer for seekers of truth to open their Bibles and consider its relevance in their own lives. It a scholarly and well-considered document written in the style of a free-flowing essay that covers a number of different Biblical topics dear to the author’s heart. The words on these pages can lay an unshakable foundation for young believers and old believers alike. It will strengthen their convictions as they journey through life with all of its pitfalls and snares. View a synopsis of “A Biblical Christian Worldview” on YouTube. 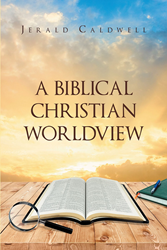 Consumers can purchase“A Biblical Christian Worldview” at traditional brick & mortar bookstores, or online at Amazon.com, Apple iTunes store, Kobo or Barnes and Noble. For additional information or inquiries about “A Biblical Christian Worldview”, contact the Christian Faith Publishing media department at 866-554-0919.